Place first 9 ingredients into slow-cooker. Cook all day until tender. Stir spinach into soup just before serving (if using). Preheat oven to 220°C/200°C fan forced and line two baking trays with baking paper. Places tomatoes onto baking trays; drizzle over two tablespoons of the olive oil and season with salt and pepper. Roast tomatoes for 20 minutes or until soft. Puree tomatoes in a food processor or blender till smooth. Strain through a sieve and set aside. In a large saucepan, heat remaining oil over medium heat, add onion and garlic and cook for 3 minutes or until onion softens. Add tomato paste and cook for a further 1 minute to remove the raw tomato taste. Pour in stock, tomatoes and sugar and bring to the boil; reduce heat and simmer for 15 minutes. Stir in lentils and bring back to a simmer, then season to taste with salt and pepper. Mix together yoghurt and basil and season with salt. Divide soup among warmed bowls, top with basil yoghurt and a grinding of black pepper. 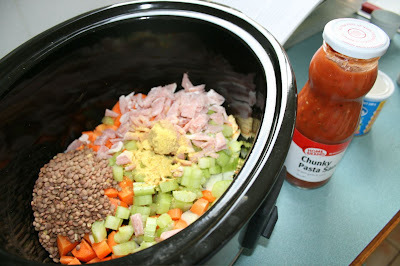 I love my slow cooker, and will definetely give this recipe a whirl. Good to see you doing 'Recipe Monday' again. I agree 100% everyone should have a slow cooker especially for winter! We have a meal in it at least once a week especially on a Sunday with afternoon church. I have misplaces my booklet for our's but seem to recall you can cook a roast chicken in it anyone want to share how and if they ahve done one!